This article in the New York Times gave a great illustration of what I worry could happen if Brett Kavanaugh is confirmed to the Supreme Court. President Trump has pledged to appoint Supreme Court justices who will vote to overturn Roe v. Wade, the 1973 decision that established a constitutional right to abortion. Justice Anthony M. Kennedy was a cautious supporter of abortion rights. As illustrated in the article, while Kavanaugh may respect Roe as settled law, he could vote with other justices to give more power back to the states. Missouri is an example of how we cannot afford to have that happen. When I had my abortion in November 2016, there was only one Planned Parenthood in the state of Missouri. I had to wait 72 hours, and because of that, bumped up against the deadline in the state for how late I can get an abortion (21 weeks, 6 days, and I had my abortion at 21 weeks, 5 days). I had to sign awful consents and with all of that, still didn't hit all of the many abortion laws that Missouri has. Some of them have been ruled unconstitutional in other states. If, as Senator Collins says, Brett Kavanaugh has said he'll respect Roe v. Wade as settled law, that doesn't meant that he'll not vote with other judges to give more and more power to states to decide what is legal or not. That is also very, very dangerous to women's rights and health. Missouri is already a very difficult place to get an abortion, and that abortion will be granted with two heaping spoonfuls of judgement and a side of biased, flawed information. For example, the consents I had to sign didn't also discuss both the pros and cons of pregnancy - only those that presume a human life starts at conception (a belief that is not supported by the scientific community) and ignore facts like maternal mortality rate (the US has the highest rate outside of third world countries) and risk to the mother's health. If they were balanced, I'd respect them more. We cannot afford to have our reproductive rights undermined any further; indeed, we need to be gaining rights back that have been taken from us from deeply conservative lawmakers that have shown, in my persona experience in reaching out to them and testifying next to them, to have no understand or desire to learn about what real women face. These laws are dangerous, ignorant and disrespectful. We need to ask our Senators to vote no on Kavanaugh because his confirmation would deeply threaten abortion access. It's what is right for our privacy, humanity and health. No one deserves to get to tell me what, legally, I am allowed to do if I find myself in a situation again like I did with Grace. Only I was in the room with all of the doctors, seeing the ultrasounds and hearing the diagnosis and odds of survival. To allow lawmakers that don't care about our circumstances to decide for us is blatantly wrong. Please call your Senators today and ask them to vote no on Kavanaugh. You can find their contact information here. Please Call Your Senators: Roe v Wade is About Personal Liberty, not Abortion. It was a huge honor to share Grace's story as well as hear the other speakers explaining why Brett Kavanaugh's confirmation to the Supreme Court and subsequent votes could threaten our rights. Roe v Wade isn't about abortion - it's about personal liberty. A government that can tell us we cannot have an abortion can also tell us that we must have one. That's an inappropriate and terrifying amount of responsibility to give the government, and I can tell you from my experience, their judgments and decisions do not match the circumstances we find ourselves facing. Please read and call your Senators and ask that they vote no on Kavanaugh. Even Senators that you think have already decided - I am hearing that they are hearing far more from people that are for Kavanaugh than against. Regarding the Aug. 22 news article " Sen. Collins says Kavanaugh sees Roe as 'settled' ": Sen. Susan Collins (R-Maine) is described as "a centrist who supports abortion rights." If she votes to confirm Judge Brett M. Kavanaugh to the Supreme Court, she will have exposed that reputation as a sham. On Tuesday, October 3, Congress will be voting on House Bill 36 which is a 20 week abortion ban. If this had been in effect when we learned about Grace's disease last November, we would not have been able to terminate the pregnancy, thus meaning I would have had to continue carrying her until she was either crushed to death by the pressure of my body without amniotic fluid to cushion her, or I would have delivered her to immediate pain and suffering and death. No child with the bilateral type of her disease (which she had) has survived, according to the many doctors we have discussed this with. There is no medical intervention for this. My own risk would have gone up 7 times. If you'd like to help fight against this (and I'd be grateful if you would! ), here is a script you can use for calling your representatives. Currently, the vote is scheduled for Tuesday, October 3rd. Step 1: Find your representative here. Step 2: Call them up! This might sound daunting but I can promise you that dialing is the hardest part. A staff member (not the representative) will answer. You need to say you are a constituent from [say your zip code] and would like to discuss House Bill 36, and request that your representative vote no on it. This is another instance of politicians inserting themselves in the most private and personal medical decisions best left between a woman, her doctor, and her family. More than 99% of abortions occur before 21 weeks. Those that occur after 20 weeks are often cases of very much wanted pregnancies that have gone horribly wrong (like mine). This is not about protecting pregnant women or babies. If it were, how would they answer my situation (and the 1% of women that terminate after 21 weeks where their health suffers and their child will die a very painful death if they cannot terminate? This flies in the face of the stated intent of the bill). This is a political move, not one designed with health in mind, otherwise, it would not have medical falsehoods as the premise. Step 4: Thank the staff member for their time and for listening. That's it! If you'd prefer not to call and to instead fax a message in, Resistbot is an AMAZING tool for this where you can fax from your phone or Facebook messenger! So easy! I, and all of the women that still have this devastating situation still to come in their lives (your daughters, cousins, sisters, nieces, wives...) all thank you. Even the ones that think they wouldn't: trust me, you wouldn't want to not have the choice to do what you think is best when you face this. You deserve the right to make the choice, even if you'd make a different one that we did. One of the things that has made losing Grace a little more bearable has been the support from friends and family. I feel like that sentence is so generic it almost doesn't mean anything, but in the moments when you get a card/flowers/text/visit, it makes so a profound difference that no sentence could really capture it. I have friends and family that run the gamut across belief systems, including very conservative, Catholic family to deeply liberal, atheist friends and every single person has chosen to show us love and support to whatever extent they find possible. It's been an amazing gift in our lives as we navigate this. It's a unique sort of grief that comes with being presented with such a heartbreaking reality and decision for a very wanted child, and then additionally having that decision be so condemned by much of society. I have been called a murderer more than once. Thankfully, never by anyone whose opinion I value. I quickly become overwhelmed by gratitude for our friends and family when I pause for even a second to consider their generosity of love and spirit, but today I want to put a little spotlight on my friend Dana, who I have known for around 12 years. She has been a great friend to me, from saving my cat's life to being one of two people (along with our friend Beth) that introduced me to Jim. Dana was halfway around the world on her honeymoon with her husband Ben when we learned about Grace's fatal fetal diagnosis, and took the time to send us a note expressing her condolences and support when she learned. Little did any of us know she would come home shortly thereafter and learn she was pregnant herself. It put us in a predictably awkward situation with me having just ended a pregnancy I had chased for nearly 4 years, and Dana in the impossible situation of trying to figure out how to tell her grieving friend she was pregnant. She was kind, considerate, and has made sure I feel remembered during her entire pregnancy. It has made a world of difference to me. When I testified during Governor Greitens's 20k/day special session, I had to cancel dinner plans with Dana and a few friends to make the logistics work. Despite being around 30 weeks pregnant, working full time and facing the last minute nature of testifying (I found out at noon that I was leaving around 7 am the next morning), Dana dropped everything to join me. She drove with me 2.5 each way and sat in the Senate room all day with no breaks for the opportunity to support me and share her own perspective: that watching what the state of Missouri had done to Jim and me after we made what we believe so strongly to be a loving, humane decision to end our pregnancy had cost Dana comfort, security and joy in her own pregnancy. She realized it could happen to anyone, saw how deeply it affected us, and felt compelled to say something to protect other families. Her testimony was powerful, vulnerable and impossible to ignore. I have always been and will continue to be grateful for Dana's friendship: at a time when it undeniably might have been more comfortable for her to distance herself from my circumstances in order to feel more secure in her own (especially as a first time mother), she pulled me closer. 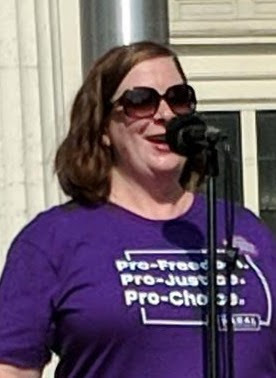 Dana put her own comfort and safety on the line and stepped out of her comfort zone to speak up for me, Grace, herself and every other woman in Missouri. I am in awe of her strength and her ability to not only own her power, but to also realize and capitalize on the absolutely true fact that anyone can advocate and make a difference: we all have a story, and Dana sharing hers truly made a difference. I can't wait for her baby to be born (any day now!) and to see what kind of mom she is, but no matter how she approaches it, that is one lucky baby to have such an amazing mom. Jim's and my testimony. I have sent our testimony about how we learned about Grace's fetal anomaly, subsequently terminated the pregnancy, and how it was to undergo this in the state of Missouri in letter format a few times when there are bills being evaluated, and so on. Jim shared his testimony when he testified against HB 757, a 20 week abortion ban being proposed currently in Missouri. You can read the bill here. You may notice that the bill does not have exceptions for fetal anomalies. It is also scientifically inaccurate according to five doctors we've talked to so far, all whom independently said a fetus doesn't feel pain until 28 weeks, not 20 as the bill asserts. So HB 757 is a great example of a bill being both based on false and/or disregarded medical science (where the law is designed to allow politicians decide when a fetus feels pain over experienced medical professionals that specialize in this), and without fully considering everyone that might be impacted by it. My Op Ed in the Washington Post. Senator Feinstein referenced my Op Ed in her opening remarks, so I felt it was important to include. While each circumstance is different, the common threads of utter shock upon the news of a fetal anomaly, feeling 100% that termination of the pregnancy was the best option, government interference and astronomical expenses show up in nearly each story. I gave the folders to Senators, legislative counsel representatives and other individuals where their understanding of the issue and its impact is very important; these are some of the people that need to know the realities of who these laws fully affect and in what way, so they can be enabled to support and/or make different policy decisions in the future. I know it won't change every mind, but I am very hopeful that raised awareness will help in even a small way. It's discouraging to think that a lawmaker would know of our circumstances and still choose to pass a bill that makes carrying out our decision, made out of parental love, even harder, but at least they will have been informed rather than just unaware. I am grateful for the opportunity to have been able to personally hand these packets to Senators and other individuals of great influence. Being invited to Judge Gorsuch's confirmation hearing is a once-in-a-lifetime opportunity, and I am still overwhelmed 2 weeks later. Being in the room while people like Sandy Philips told the story of her daughter losing her life to gun violence in the Aurora, CO theater shooting was one of the saddest privileges of my life. The impact was overwhelming, and I wasn't the only one moved to tears by her testimony. Watching testimony like Sandy's as well as watching the Senators interact with each other and with the witnesses served as a great reminder that we're all human beings. We all have feelings and senses of humor and things that outrage us. Many of us are really putting ourselves out there hoping that in exchange for letting people evaluate and assess us based on what we're sharing (even Sandy was subject to some of that), that the payoff will be educating some people and bringing about some change. I am grateful for the opportunity to share my story, and to the other women who have so bravely shared their stories. We are all possibly subjecting ourselves to having our accounts of their darkest days ripped apart by strangers, all for the chance to hopefully educate the public and our elected officials on the realities of later term abortions, and to hopefully help usher in some change. That's absolutely the hope of every single person that shares. That's how strongly we feel about it. I can assure you the attention we garner is more negative than positive, and some days it's hard to keep going. We share to hopefully help prevent other families from facing at least the legal and stigma-related pain in the experience. Do you have a story about ending a wanted pregnancy? Please feel free to contact me. Every single story helps make a difference!